More Political Risks Ahead in Europe? Political risks are ongoing in Europe as German Chancellor Angela Merkel recently failed to form a four-party coalition as she attempted to broker a deal between the CDU/CSU, Free Democratic Party and Greens following Germany's September elections. On top of that, UK Prime Minister Theresa May has also been struggling to break a deadlock in Brexit negotiations. This is in spite of her offer to give ground on potentially doubling the divorce bill to £40bn. On the German front, Merkel now has three options: form another grand coalition with the Social Democratic Party (SPD), form a minority government or head for new elections. In the meantime, opposition SPD leader Martin Schulz has come under immense pressure from both within and outside his party to consider forming a grand coalition in order to avoid fresh elections. Meanwhile – despite May's offer to increase the Brexit divorce bill – EU negotiator Michel Barnier has rejected the notion that London City will enjoy preferential access for financial services after Brexit. Despite these uncertainties, Citi analysts are overweight on Europe ex-UK equities as improving earnings-per-share (EPS) momentum, eurozone growth and attractive valuation (especially against bonds) might continue to support European equities. Citi continues to be positive on sectors such as cyclicals, financials, commodities and technology. These political risks have sent policy certainty on a different course in eurozone and the UK. While Brexit talks are ongoing, uncertainty and earlier declines in the pound seem to be setting off deterioration in the real economic growth rate. 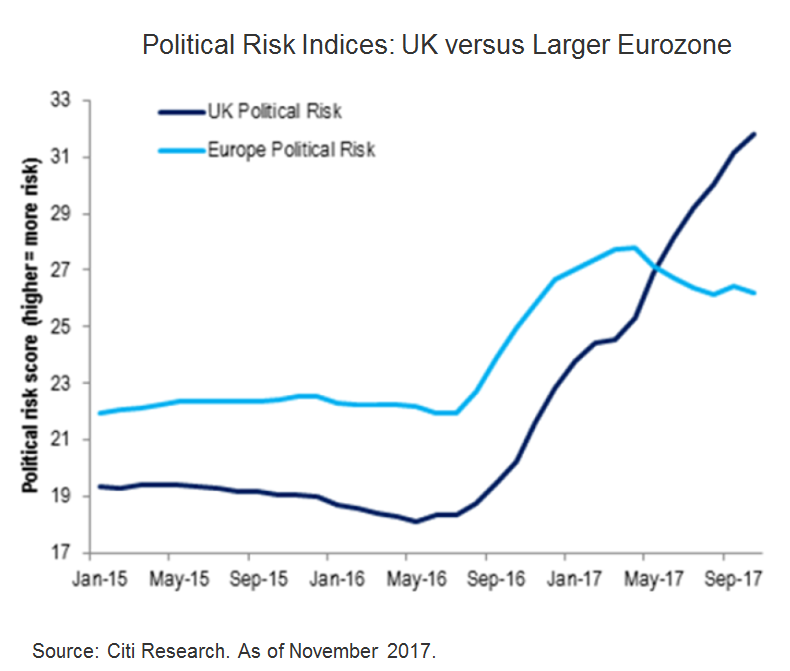 As such, Citi is underweight on UK equities in light of ongoing Brexit risk and lagging EPS momentum.